NOTE: This sketchbook does not feature a tutorial! Have you ever gone on a wonderful vacation, had amazing experiences, taken lots of photos to record the great times you had, then got home and hardly even looked at them again? Even your friends yawned (politely) when you shared the photos? It doesn't have to be that way! 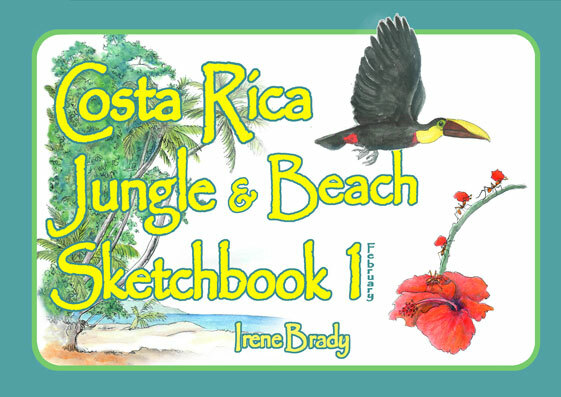 This journal of Irene's nine-day adventure discovering Costa Rica jungles and beaches shows you how to give your vacation a terrific "afterlife," that will be enjoyed again and again by you AND your friends (click on images to see close-ups). The journal and sketches celebrate the jungle, the leaf-cutter ants, huge-billed toucans, skittery lizards, raucous parrots and macaws, chameleon frogs, turtle-egg-thieving coatis, and roaring howler monkeys; as well as the magnificent beach with its myriad shells, fascinating plants, and the peculiar things that wash up on the beach. You can get light-bulb ideas about how to chronicle your own vacation by studying the sketches and journaling techniques. There's even a bus trip for most of a day across central Costa Rica to explore La Selva (the jungle), in the Monte Verde Cloud Forest. There during a ramble through foggy green jungle and across eight suspension bridges, the fabled Resplendent Quetzal makes a cameo appearance, and a tiny Slaty-backed Nightingale-Thrush hops alongside on the trail, staring curiously at the dawdling artist. You'll be delighted by the drawings in ballpoint pen (many of them colored with watercolor pencils) and the text that observes, wonders, delights and ponders the many strange things seen during the adventure. Two bonus pages at the end describe the setting and background of the trip, the sketching tools used, and an excerpt from Irene's Nature & Travel Sketch Journaling workbook explaining how to remove or add pages and redo the cover of a coil-bound trip journal. is in the form of a PDF which you can download with Adobe Acrobat,save to your computer, and print out immediately on 8½ x 11 paper (heavy paper is recommended).